This epic 33 day India rail tour, Kolkata to Kochi, takes you from the banks of the Hooghly River in old Calcutta (now Kolkata) through the tea estates of Darjeeling and onwards to Delhi, Agra and Jaipur with a whole lot of cultural highlights and captivating natural landscapes in between. Travelling from Kolkata to Kochi on an India rail tour peels back the veil of mystery that covers the country to reveal not only the cultural treasures of Rajasthan but also the southwest beaches and backwaters from Goa to Kochi. An India rail tour is one of the most authentic ways to travel from Kolkata to Kochi with just one domestic flight from Mumbai to Goa providing a means of finishing the last leg of this 33 day tour in the most efficient way possible. When we think about the future we often think about the state our planet will be in for future generations. India is one country whose environment is really suffering due to population density and so when travelling there it’s important that we know we’re doing our best. Our company has operated with responsible tourism values since our inception. From an environmental perspective, our initiatives extend from our company offices to our tours with our tour leaders providing you with information about local environmental issues and suggestions of how we can best protect the local environment and culture. Excellent lessons to take home with you! Low Impact Transportation: You’re not only seeing India in style but with so much train travel on this trip you’re doing your part in protecting the environment, rather than seeing it by car, bus or plane. Community is important and feeling like you’re a part of it is an integral part of travelling. On this trip you might opt to take a walking tour of Delhi guided by one of our Planeterra-supported former street kids. In Jaipur, choose to visit local artisans in a nearby village or in Udaipur, take a cooking class. Included in this trip, in Kalimpong, you’ll learn how to cook some delicious local cuisine and then enjoy it with a family. 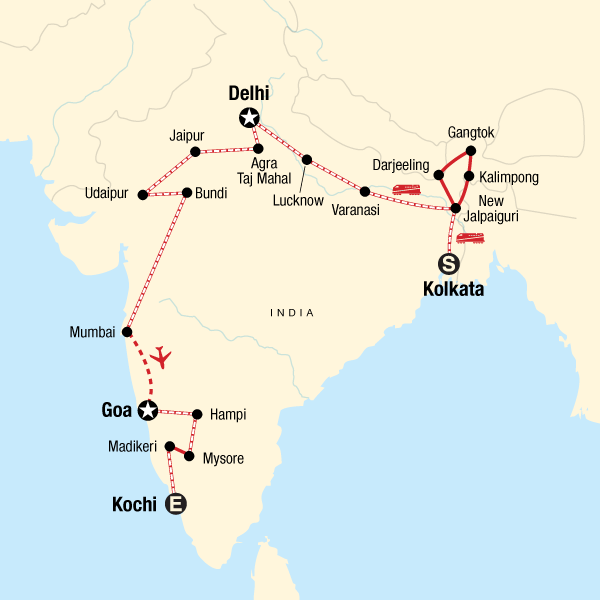 You’ll also experience the Darjeeling toy train and visit a few World Heritage Sites such as the Group of Monuments at Pattadakal, the Sun Temple at Konarak, Jantar Mantar in Jaipur, Agra Fort, Taj Mahal, the Darjeeling and Nilgiri Mountain Railways, Mumbai’s Chhatrapati Shivaji Terminus (historic train station) and Elephanta Caves, and the Western Ghats.